Basil essential oil has a fresh, spicy, herbaceous aroma. It is renowned as a stimulating oil and can be used to clear the mind and counteract fatigue. It is also recommended for head tension, respiratory problems and muscular aches and pains. Basil essential oil is steam-distilled from the leaves and flowering tips of the popular 'basil' herb. Different chemotypes of Basil essential oil are available. CT Linalol is generally considered the safest to use in aromatherapy due to its lower estragole content. Estragole, also known as Methyl Chavicol, is a suspected carcinogen when used in high doses. Avoid if pregnant or if your skin is sensitive. Do not use in high concentrations or for prolonged periods of time. The high linalol content in Basil essential oil is believed to help repel insects. Basil oil has a cephalic action which means that it helps to stimulate and clear the mind. It is an excellent choice for combating nervous disorders, intellectual fatigue and indecision. 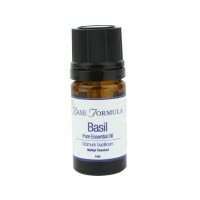 Basil essential oil is beneficial for headaches, migraines, muscle tension and pain. It has an affinity with the respiratory system and makes a warming inhalation for chesty coughs, bronchitis, asthma and sinus infections. It is a good tonic for the digestive system and may be of assistance in treating menstrual problems. Eugenol 15% Geraniol 0.2% Citronellol 0.3% Limonene 1% Linalool 62%.